Let’s face it: Few children are naturally fond of vegetables. When given the choice between vegetables and fruit, most children will choose the sweeter option. Perhaps carrots and sweet red bell pepper may make it into their mouth. 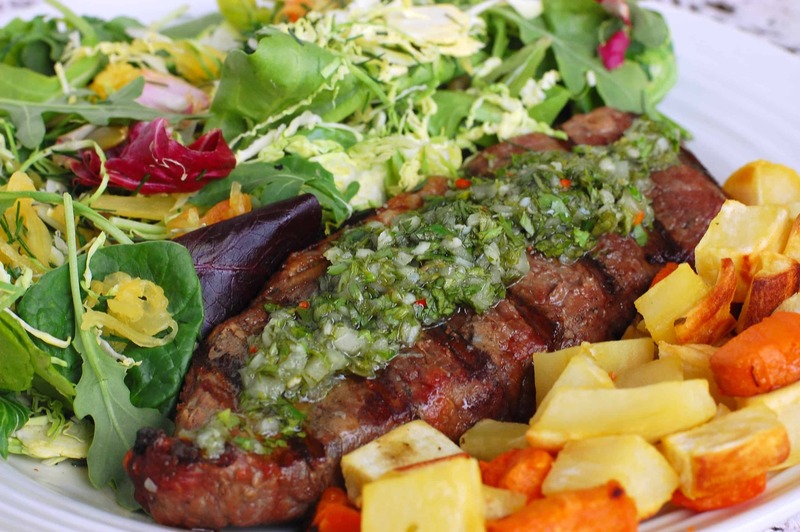 Other vegetables like broccoli, asparagus, or spinach may remain on their plates long after everyone else has left the dinner table. There are, however, those children – most angelic in a dietitian’s eyes – who ask for vegetables and devour asparagus and daikon radishes without being told or bribed. If you thought vegetables were difficult to make appealing to kids, fermented vegetables may be even more difficult. Tangy, sour, and odd-textured, fermented vegetables may either be hit or miss among children. Some kids love pickles or sauerkraut (at least some days of the week or times of the day) while other kids can’t stand the smell of a cleaned sauerkraut jar. When handing out samples at markets, I’ve seen numerous puckered faces with squinted eyes and scrunched noses upon first trying sauerkraut. 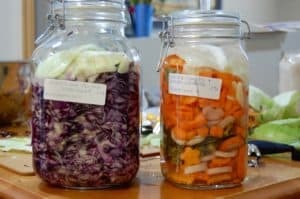 Regardless whether children are asking for more or are repulsed by the smell, there are ways to make vegetable ferments more appealing. 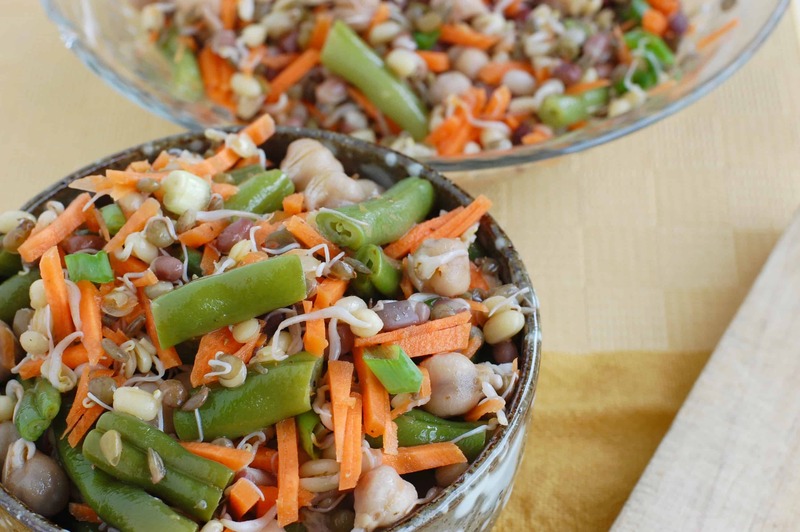 Below are six tips to make fermented vegetables more appealing to children. Increasingly, children are more and more removed from knowing where food comes from. The same is true of traditional food practices such as fermentation. Ask children where cabbage comes from. Likely, they’ll respond, somewhat accurately, “The grocery store.” Ask children where sauerkraut comes from. If they’ve never seen it being made at home or stored in the fridge after purchasing from the market, they may not have the slightest idea about its origin. The mystery of fermented vegetables will remain a mystery if children aren’t shown or told about it. 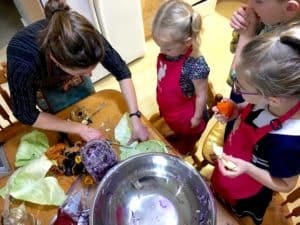 Exposing children to the process of fermenting cucumbers from the garden into dill pickles, yummy carrot sticks into pickled carrots, or shredded cabbage into sauerkraut may help them connect the dots between field and plate. Familiarity with a food’s origin may break down barriers kids have to trying new foods, such that their curiosity may prompt some sampling. Children are notorious for being copy-cats! Guess what mom and dad. You are their heroes, the ones they look up to, the ones they watch intently, the ones whose words, behaviours, and emotions they copy – at least until they become teenagers. Even if children do not have a natural palate for vegetables, seeing their role models (i.e. you) eat fermented vegetables may persuade them to try it too. We’ve heard it said, children need up to twenty food exposures before they develop a liking for it. Seeing role models eat fermented vegetables is one type of food exposure; offering it to children in a variety of ways is another. 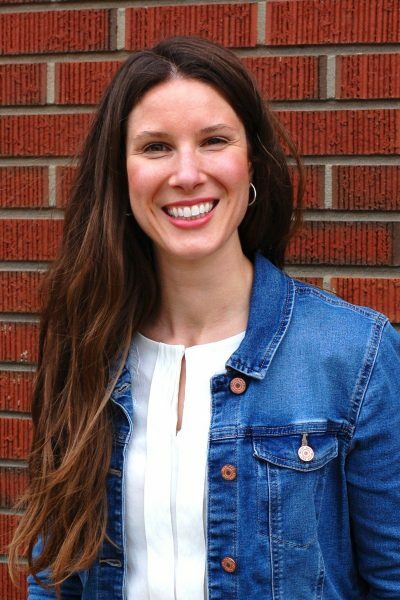 A highly acclaimed expert in raising healthy children and creating stress-free eating experiences, Ellen Satyr, coined a well-known feeding principle for parents. She recommends parents determine when, where, and what food is served, while children determine how much they eat or if they eat at all. Children have the choice to refuse any food presented to them. This may sound off to those of us raised with the expectation of finishing everything on our plate before leaving the table. Satyr’s method for presenting food to children has stuck with me since first hearing it. Applied to fermented vegetables, it means parents are responsible for presenting vegetable ferments as many as twenty times to their children with the chance (or likelihood) of repeat rejection. And that’s completely okay. You’ve done your job. Consider starting with as little as one teaspoon of sauerkraut on sausage dogs, a slice or two of fermented dill pickles in a grilled sandwich, a few sticks of fermented carrots with dip, a tablespoon of kraut or pickle brine (loaded with probiotics) in smoothies, or a dollop of fermented salsa with tacos. NOTE: Fermented vegetables are not recommended in high amounts for infants under one year old. The salt and type of lactic acid, D(-) lactic acid, from fermented vegetables can overwhelm the kidney filtration capacity. Priming their taste buds with the tangy, sour taste of fermented foods is best done in small doses. For example, parents can dip their finger into fermented brine from sauerkraut, kvass, or pickles, then put it into the infant’s mouth. Be ready with a camera to catch a puckered face!! Whoohoo! The earlier the exposure to fermented vegetables, the more accepting children may be of tangy fermented foods. That means better gut health! 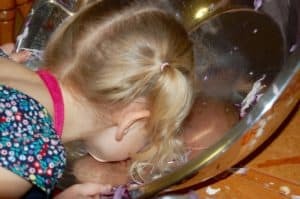 Children love getting their hands in things, especially if that means smearing, squeezing, and tossing wet shredded food around in a giant bowl. 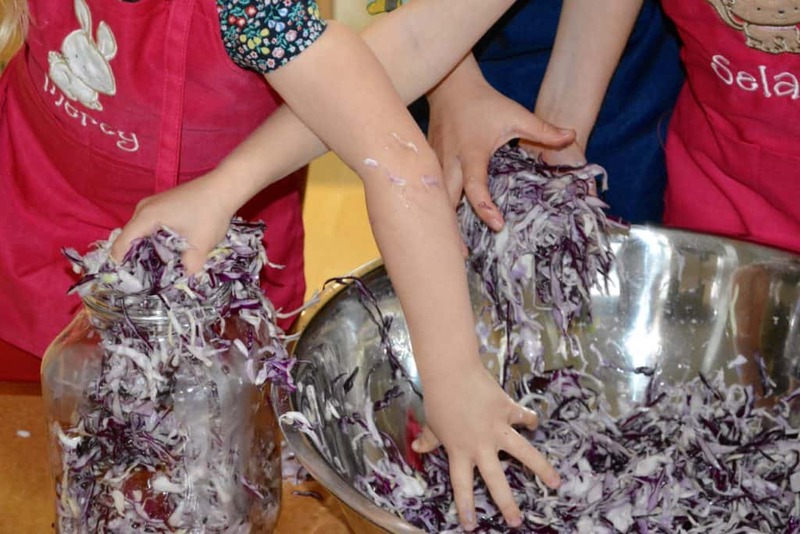 They are often told, “Don’t play with food.” However, involving your children in making a batch of sauerkraut, gives them an excuse to break the rules. It also helps children associate sauerkraut with fun. Even if involving them makes a mess, it is well worth creating a positive experience for your children with foods they may otherwise reject. Brooms were meant for sweeping up things dropped on the floor. Relax. 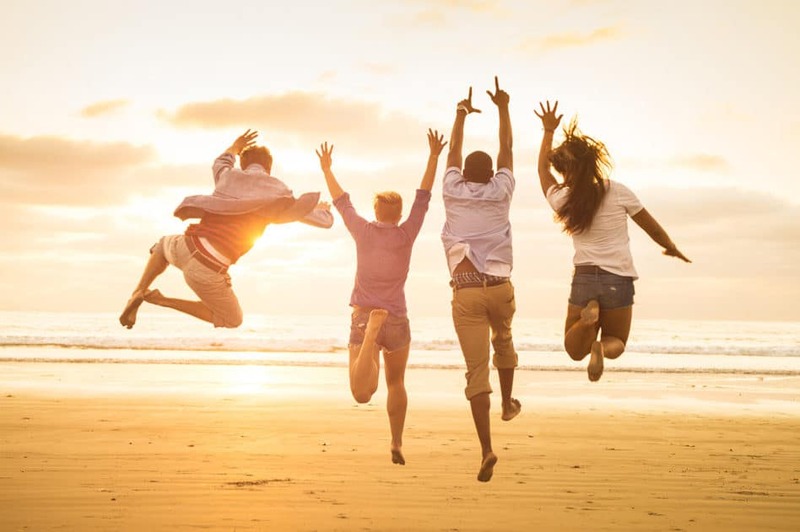 Enjoy the moment, and be ready with a broom. 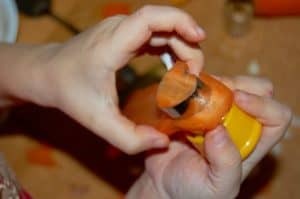 Another way to make fermentation tactile is by asking children to help press shapes in carrots, daikon radishes, kohlrabi, bell peppers, or turnips for lacto-fermented (brine-pickled) vegetables. Vegetable cutters are available from Amazon here. Again, children who are involved in food prep are more likely to sample the end product. Colour is pleasing to the eye regardless of age. As children learn colours, vegetable fermentation offers a great review: purple from cabbage and beets; orange from carrots and bell peppers; white from cabbage, onions, leeks, garlic, and cauliflower; red from chili peppers and tomatoes; yellow from zucchini and onions; green from broccoli, celery, kohlrabi, cucumbers, and summer cabbage. Parents may also want to highlight the change in colour as fermentation progresses. Making sauerkraut with a combination of green and purple cabbage will yield a transformation from deep, dark purple with distinct green shreds to a wash in pink. Likewise, pickled cucumbers start bright green, then yield a mossy green as the lactic acid bacteria work their magic. Lastly – the part I am most passionate about sharing – teach children about the beneficial microbes. Use the spontaneous bubbles that surface on the second or third day of fermentation to teach children about invisible microbes. Explain that the bubbles are carbon dioxide being produced by microbes, which is the same gas we exhale. Bubbles are evidence that there are tiny germs living in the ferment. Link these germs to the health benefit we receive from eating these foods. 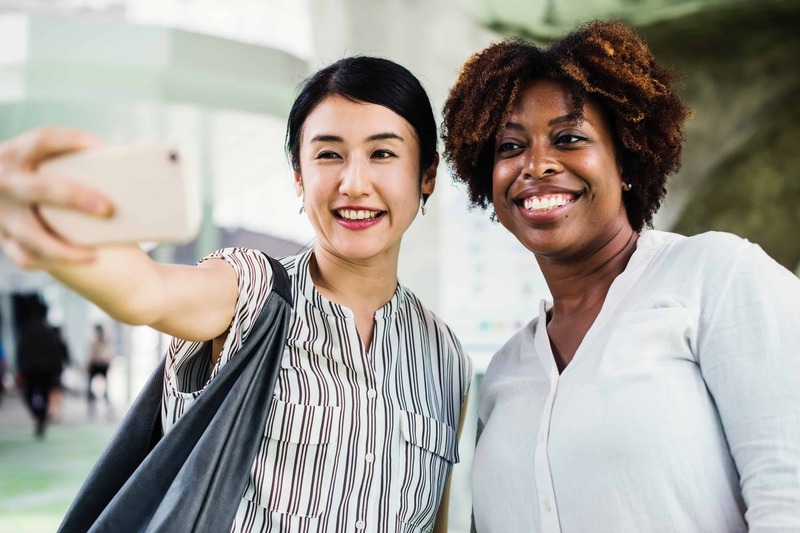 Of course, a picture of smiling microbes always helps emphasize that these microbes are friendly and nice – nice for our taste buds and nice for our bodies. 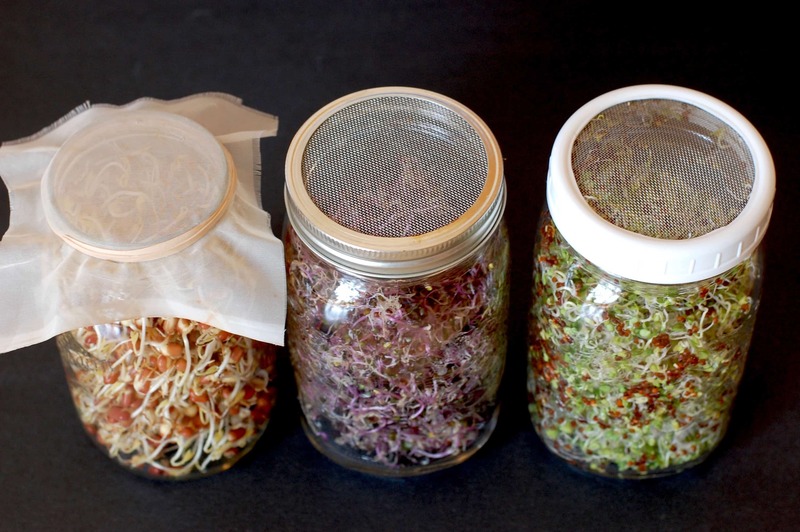 I hope your children will develop a liking for vegetable ferments, thus a healthy gut for current and future health. Who knows. Maybe they’ll like fermentation so much that they start drinking cabbage juice from the bottom of the bowl. A special thanks to Joelle and Morgan Allan for allowing me to do some science, art, math, and health with their three cute kids.